"You're doing this," She said, her eyes searing into mine with an unrelenting intensity. For a moment I contemplated saying, "No" -- telling her that I don't drink tequila, that I'm too old to take shots, that I can't possibly mix hard alcohol with Sauvignon Blanc. "That's a hangover waiting to happen," said the voice in my head. "That's a good time waiting to happen," countered a different voice, the voice of the girl I occasionally was in college when I wasn't busy retyping my history notes or hydrating for a cross-country race. Instead of heeding the preliminary warning, instead of being the boring, grown up version of myself that stays in on Friday nights to do a face mask and make granola, I found myself nodding. I found myself reaching out for the shot glass and studiously following Ashley's lead. I found myself taking the red pill. I'd blame it on Ashley and Palm Springs and the craziness that is a bachelorette weekend with seven other girls who have all been wound a little tight as of late, but the truth is I wanted that shot. Just like I wanted to go to see The Hunger Games even though I hadn't read the book yet last month, just like I wanted to order the entire dessert menu a few Saturdays ago, just like I wanted to stay out until after midnight drinking beer with friends a couple weeks ago on a school night. I was, and I am, tired of coming up with reasons to say, "No." 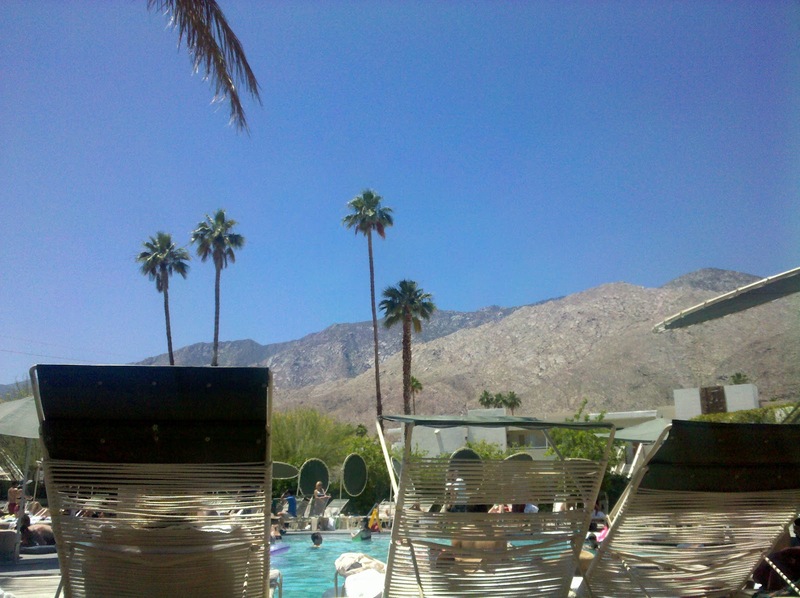 My mission to make 2012 "the year of yes" was fully realized in Palm Springs two weekends ago. I took the tequila shot. I stayed up past 2 a.m. And then past 3 a.m. the next night. I wore a fedora and a romper without shame. I painted my toenails turquoise. I went swimming in the pool. I got my hair wet. I lounged outside for hours reading and staring into the piercing blue horizon. I told a random guy I wanted to squeeze his oversized beard. And then I did. Twice. I flopped on the bed until my lower legs were bruised beyond recognition. I ate all the hash browns. I played ping pong in my bikini without worrying about whether anyone was looking at my cellulite. I drank sparkling wine out of a pink can -- with a straw. I dove on top of the giant plastic orca whale. Except in my personal, inverse version of the Matrix, Palm Springs was the illusion; LA is reality. I've been fighting a case of post-Palm Springs depression since leaving the 100 degree poolside cocoon two weeks ago. When I'm not asking Ashley why we aren't presently in Palm Springs, I'm doing what I can to recapture the carefree feeling I experienced there. I'm cooking dinner (carefully) in my bikini. I'm keeping my toenails painted turquoise even though I suspect it makes my toes look like alien bobbleheads. I'm drinking spicy cocktails that have tequila in them instead of my standard glass of Sauv Blanc. And when I'm ready for a little kernel of reality, a hit of the blue pill to counterbalance all that "craziness," I'm eating this quinoa salad. Bring water or chicken broth to a boil. Add the quinoa, ginger and currants and reduce heat. Simmer, covered, for 15 minutes or until all the water has been absorbed and the white shells have separated from the quinoa kernels. Remove the lid, fluff with a fork and set aside to "dry" for 15-20 minutes. Meanwhile, whisk together apple cider vinaigrette, olive oil, honey, and Dijon mustard. Season with salt and pepper. Once quinoa has cooled and "dried out" sufficiently, toss with shredded carrots, red onion, chickpeas, and apple cider vinaigrette. Refrigerate for at least an hour. When ready to serve, toss with arugula and almonds. Serve immediately. I wasn't going to tell anyone about it. I didn't want to jinx it -- the potential of something that could be... well, something. He made me laugh, he got my weird, lame sense of humor, and didn't think it was crazy that I go to church on Sundays and have on obsession with dried mango and Bon Iver and bad puns. He was going to be my secret. Or at least he was until we actually met in real life -- in the world outside OkCupid and casual, banter-y text messages. It was hard for me to keep it quiet... to keep it tucked away in a shoe box under my bed that only I knew was there. I'm not good at keeping things private. I can barely even eat breakfast without taking a picture and tweeting it for all my poor followers to see. And it's only with great painstaking effort that I've finally started to reign in my compulsion to check in on Foursquare every time I leave my apartment. Mostly because I realized that not everybody cares that I'm at Bar Method. Again. Whether it's something as mundane as the quinoa I ate for dinner or my last workout, I like sharing things -- and myself -- with others. Half the fun of discovering a really great dessert at a new restaurant or having a crush on a boy is telling someone (or 2,000 someones) about it. But with him I wasn't ready to share it yet. I wasn't ready to verbalize it lest the verbalization make it suddenly more real than it actually was -- more than just a few funny messages and text exchanges -- and thus harder to let go if and when it didn't end up being right. Again. The problem with constantly draining personal information into the ether of social media or airing it in vivid recounts to anyone who will listen (Bar Method receptionist included), is that when the boy isn't the one, when the story doesn't pan out, and when the chocolate chip cookies turn out burnt and misshapen, those failures are also visible for everyone to see. As much as I love wearing my heart and what I ate for dinner on my sleeve, I hate having to explain the why when things go awry. Why I won't be ordering "His" and "Her" towels monogrammed with our initials, or retelling the story of how we met to our children and grandchildren and, again, that poor Bar Method receptionist. It salts the wound, weakens my ability to build up hope for the next time, and makes me want to shut that part of me down completely. It makes me want to say, "Down with love!" Down with heartache. Down with dating sites that keep telling me a 5'2'' unemployed actor whose favorite restaurant is Chipotle is my soul mate. The problem is as much as I try to be rational and guarded, I can never stop romanticizing life. As much as I try to tell myself not to fall head over heels into the fantasy scenarios I create in my head, I always do. And I always tell someone about it -- usually before, during and/or after. Tonight I'm putting the boy back in the shoe box under my bed, tucked away next to the bills I keep forgetting to pay on time. I'm not going into the who, what, when. And I'm especially not going into why it didn't end with a hopeful, "We should do this again sometime." Tonight, I'm romanticizing pasta. Creamy, goat cheese-laden strands of noodles, coated with egg and spring vegetables and bright bursts of citrus that punctuate every bite. It's totally dreamy. Totally hot and heavy. And totally the one for a colder than average spring night in Los Angeles. Combine goat cheese, 1 tablespoon Parmesan, Meyer lemon juice, and egg yolk in small bowl. Whisk well to combine. Set aside. Bring large pot of water to boil. Add the spaghetti and good pinch of salt and cook according to package instructions. While the pasta is cooking, heat large frying pan over medium-high heat. Add the teaspoon of olive oil, then add the shallot, minced garlic and saute for 2-3 minutes, stirring frequently so the garlic doesn't burn. Add the asparagus and fava beans and season with salt and pepper. Continue sauteing for another 2 minutes. Turn off heat and set aside. When the pasta is tender, yet still slightly al dente, drain, reserving 1/2 cup pasta water for thickening the sauce. Immediately toss the hot pasta with the goat cheese/egg yolk/Meyer lemon sauce to the pasta. Stir in the vegetables, adding pasta water as needed to thicken. Toss together until all components are well incorporated. Serve immediately topped with lemon zest and remaining tablespoon of Parmesan.